On August 21, Abbott announced a US request had been made and his government was considering it. Australian forces have been bombing targets in Iraq and providing military support to Iraqi government forces since the US launched its war on ISIS in August last year. The US extended its air strikes into Syria, where the majority of ISIS-held territory is. But some “coalition partners”, including Australia, have so far restricted their involvement to Iraq. This is because the Iraqi government is an “ally” of the US — created by the 2003-2011 US-led occupation — and officially invited the US and its allies to intervene. Unsurprisingly, there is no such invitation from the Syrian regime of Bashar Assad, which is not recognised by the West. Foreshadowing a positive response to the US request, Abbott said on August 21: “While there is a little difference between the legalities of air strikes on either side of the border, there's no difference in the morality. Regardless of whether the US request was made at Abbott's behest, not too much cynicism is required to suspect Abbott may be motivated more by domestic political considerations than morality. Abbott has made playing the “national security” card in response to worries over declining political fortunes into a cliche. When he delivers his formal response to the US, he will follow his familiar script about how ISIS is “coming for Australia” and his government's top priority is to keep Australia safe. The only things not yet clear are the exact number of Australian flags he will choose to stand in front of and exactly how many times he will utter the phrase “death cult”. Abbott has good reason to be worried about his political fortunes. His government is still reeling from the parliamentary expenses scandal and divisions in government ranks over his confused manoeuvres to block equal marriage rights. A key re-election strategy, the royal commission investigating trade unions, has unravelled over revelations of the close ties between his hand-picked royal commissioner, Dyson Heydon, and the Liberal Party. Rumours continue emerging of his leadership losing support inside the Liberal Party, while his attempts to prevent cabinet leaks are themselves leaked. This is against the background of ongoing community opposition to the government's savage cuts to working-class living standards. The opposition Labor Party is increasing its lead in opinion polls. The government's proposed debate on “tax reform” — meaning higher taxes on the poor while lowering taxes on the corporate rich — is unlikely to revive its fortunes. 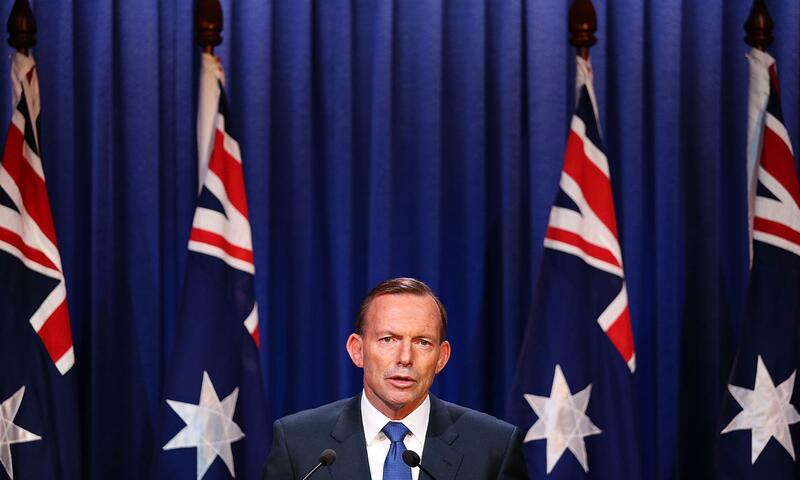 With the Canning by-election looming, Abbott making a flag-draped appeal to patriotism and paranoia became inevitable. Abbott's national security announcements follow two related scripts. One involves new repressive laws domestically to combat the supposed threat of Islamist terrorism. The other is to announce stepped-up military operations overseas, allegedly to strike at the same terrorist threat. As well as boosting the electoral fortunes of sitting governments, scaremongering on national security has allowed Australian governments and security agencies to accumulate unprecedented legal powers to criminalise dissent and circumvent legal due process. For this reason, Labor is equally committed to promoting the narrative that Australia is threatened by terrorists and it has consistently acquiesced in Abbott's scaremongering. The mainstream media plays their part, unquestionably repeating police allegations of terror plots. In reality, no one has been killed by terrorism in Australia so far this year, while 59 women have been killed by domestic violence. Indeed, no one has been killed by terrorism in Australia this century, unless one classifies Man Haron Monis, who hijacked a Sydney cafe last year, as a terrorist rather than an attention-seeking psychopath. However, it is undeniable that ISIS is committing horrific acts of violence on a large scale in the Middle East. This is the other justification being advanced for expanding Australian air strikes into Syria. Former Labor foreign minister Bob Carr told the ABC's AM on August 26: “I think there is a powerful case to be made about Australia and the West making air strikes where they're likely to have an impact in stopping ISIS from capturing territory in which it would subject the population to mass atrocity crimes. However, this argument is based on the assumption that the US-led air war is having “an impact stopping ISIS”. The evidence is that such an assumption not only ignores the air war's impact so far, but accepts at face value the US-led intervention's stated purpose. For example, the media have used ISIS's theologically inspired vandalism of ancient archaeological sites, such as Palmyra, to promote escalating the war. This iconoclastic vandalism is a common crime by groups adhering to the Salafi interpretation of Islam. Only a small minority of Muslims hold this interpretation, but it is the official ideology of the dictatorial Saudi kingdom. Yet the Saudi kingdom is one of the US's local coalition partners in its Syrian air war. Also, one reason why the US might want Australia to expand its role in the coalition is that much of the Saudi air power in Syria has been redeployed to Yemen, where the kingdom is leading an air war with US approval. A June 26 New York Times article revealed that, motivated by the same arcane theology that drives ISIS to vandalise Palmyra, the Saudi air force was systematically trashing Yemen's rich archaeological heritage. On July 23, the US welcomed Turkey into its coalition. At the same time, the Turkish government launched a full-scale land, sea and air war against forces affiliated to the Kurdistan Workers Party (PKK), as well as civilian communities, in Turkish and Iraqi Kurdistan. It also cracked down on Kurdish and left-wing activists. The US supported Turkey's crackdown and war, explicitly framing the attacks on Kurds and leftists as part of Turkey's entry into the “war against ISIS”. The US is aware of evidence that Turkey has supported ISIS as a weapon against left-wing Kurdish-led forces in Rojava (Syrian Kurdistan). The only militarily and politically effective forces on the ground against ISIS are the left-wing Rojava-based Peoples and Women's Protection Units (YPG/J). Since October, the US has been coordinating some of its air strikes with the YPG/J. The US strategy initially was to stand by while Turkish-armed ISIS forces conquered Rojava. The resulting bloodbath would have given Western powers an excuse to intervene. Turkey was set to occupy Rojava as “safe zone” for survivors of carnage carried out by its proxies. However, the YPG/J stopped conquest of Rojava by ISIS. Meanwhile in Iraq, members of the Yazidi religious minority were rescued from genocide by ISIS by PKK and YPG/J forces, after Iraqi government and Kurdistan Regional Government forces abandoned their US-supplied weapons and ran. This was the context for the limited US air force coordination with the YPG/J. But the US only reluctantly cooperated with left-wing Kurdish forces. Western financial support and military hardware continued to go to other groups and the PKK has remained banned by the US and Australian governments as a terrorist group. This reluctant cooperation is ending. Since July 23, the US has praised Turkey for striking ISIS in Syria while the YPG/J has said that its forces, and not ISIS, were being attacked. The proposal for a “safe zone” in Rojava has been revived, to be patrolled by Turkish-trained ethnically Turkic militias and with infrastructure provided by Western NGOs with a background in “state building” in South Sudan, Dicle News Agency reported on August 21. The proposed location, between Kobane and Afrin, makes it clear that its purpose is to stop the YPG/J from controlling the whole of Rojava. If Australia was sincere about fighting ISIS, it would end the criminalisation of the PKK and other laws that have frustrated attempts at practical solidarity with the democratic resistance to ISIS. The embargo preventing the YPG/J or PKK obtaining heavy weapons would be lifted and Turkish state support for ISIS would be exposed and opposed. Australian plans to join Turkey and Saudi Arabia in the US-led air war in Syria are not directed against ISIS and should be opposed.